Fits AJP levers and master cylinders. 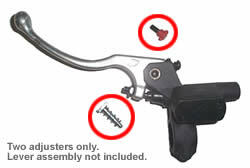 The two adjusters (inside the red circles) replaces the stock lever stop, and lever adjustor screws, allowing adjustment by hand, without tools. The spring holds adjustor position, without need for a lock nut. NOTE: Lever assembly not included. Shown for reference purposes only.